As a social innovation major at Rollins, you’ll gain the interdisciplinary knowledge and skills to lead lasting change. From global field studies to local internships and leadership programs, our major offers ample opportunities for real-world learning, advocacy, and community engagement. Want to make a difference in the world? Start here. Rollins’ social innovation major gives students the interdisciplinary knowledge and skills to address societal problems in creative, systematic, and sustainable ways, preparing you to thrive in fields such as public policy advocacy, nonprofit leadership, and community organizing. Rollins was one of the first colleges in America, and the first in Florida, to be designated a Changemaker Campus by Ashoka U. That means we’re committed to breaking down barriers to institutional change and fostering a campus-wide culture of social innovation—values that students in our program carry into their communities. Social innovation majors gain skills in areas that include human-centered design thinking, critical analysis of social problems, data collection and analysis, impact assessment, creative problem-solving, public communication, organization, empathy, and emotional resiliency. 1. See the big picture As a social innovation major, you’ll not only develop a critical understanding of problems that affect marginalized populations, you’ll gain the interdisciplinary tools to create, implement, and evaluate creative solutions. 2. 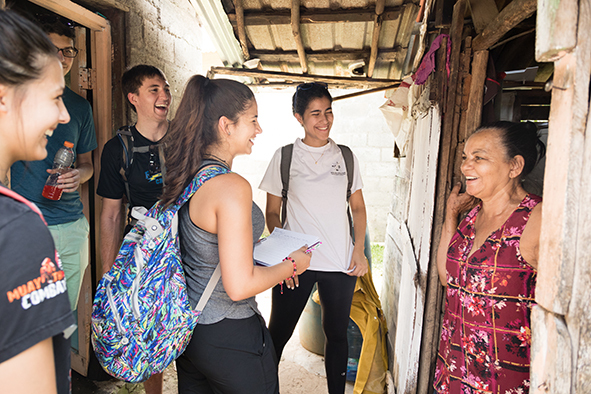 Interact and advocate From global field studies to local internships and leadership programs, our major offers ample opportunities for real-world learning, advocacy, and community engagement. 3. Do what you love With a degree in social innovation from Rollins, you’ll be well-equipped to build a productive career and a meaningful life that aligns with your passions. Rollins social innovation majors complete 10 courses from at least three different disciplines. Core courses include an introductory course, a core skills course, a topics course examining a range of social problems, a community engagement course, and an independent capstone experience. Introduction to Social Innovation This is where it all begins. Explore complex social problems and start thinking about solutions and social change. Nonprofit Leadership and Innovation Examine the inner workings of nonprofit organizations from a leadership and innovation perspective, then decide which practices can contribute to the attainment of your goals. Digital Storytelling Develop the ability to use and understand digital technologies as tools for creative multimedia expression. Create multimedia projects and study how narrative and symbols structure meaning. Case Studies in Sustainable Development Explore political concepts of sustainable development, comparing how different states confront issues such as population growth, poverty, alternative energy, hazardous waste trade, deforestation, GMOs, ecotourism, sprawl, and invasive species. Social Problems Follow traditional areas of social-problem analysis, including poverty, sexism, racism, and crime, as they evolve and transform society. Global Cultures Survey past and present peoples of the world. Explore the diversity and underlying unity of human culture from evolutionary and ecological perspectives.